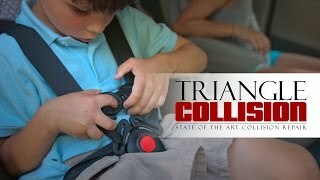 Triangle Collision is a high quality Kia body shop serving the Morrisville & Cary, NC. You need a body shop that you can trust when you have been in a collision. By following factory guidelines for repairs we can make sure the safety features you depend on are working properly. We also help you get the best resale value when you go to trade in or sell your vehicle. If you live in the Morrisville or Cary area and have a Kia that was involved in an accident, contact Triangle Collision at (919) 460-7693 or click here to contact us online! We stand behind our collision repair with Lifetime Warranties for many of our services. Our Kia repair follows the procedures recommended by the factory. This is how we guarantee that your vehicle will be repaired to pre-accident condition. We know how important it is to have a trustworthy Kia repair shop to turn to. No one plans for an accident. You need to know that your vehicle is being repaired honestly and safety. This is why we are dedicated to being straightforward with our customers through the repair process. Other shops might want to repair as many vehicles as they can, but we value quality over quantity. Our customers know the extent of collision damage, and the costs involved with getting it repaired to pre-accident condition. It’s your choice, not the insurance companies, where your vehicle is repaired. Choose Triangle Collision, the Cary, NC area’s premiere Kia Body Shop & Collision Center. In order to achieve our high quality repairs we have invested heavily into state-of-the-art equipment and high levels of training for our technicians. Each make and model has unique needs when being repaired. Our technicians follow the procedures recommended by Kia when repairing your vehicle. Modern vehicles are more complex than ever. We do this because modern vehicles are more complex machines than ever. Their parts are more meticulously designed to work together and cannot be replaced by just any part or repair. A trained technician knows when something can be repaired, or if it needs to be replaced. Not only does this ensure the car is performing as you would expect it to, but it protects the safety features as well. A major part of modern Kia design are the safety features. They have spent millions creating safer cars. You are likely aware of technology such as rear-view cameras and collision detecting sensors. However, did you know that air bags are calibrated to factor in things such as vehicle speed and passenger weight when deploying? A damaged sensor could lead to the airbag deploying too soon, or too late, which puts the safety of the passenger at risk. This is just one of the safety features in modern features that needs to be properly repaired to ensure it is ready in the event of an accident. This is why we are so dedicated to following the exact procedures recommended by Kia during our repairs. We do not take chances or cut corners when it comes to the safety of our customers. Stranded after a collision? We can help. We have partnered with Lemon’s Wrecker Service to provide our customers with 24/7 towing service. Transportation is billed directly to us so that we can include it in the overall repair bill. By doing this it is easier to wrap the full price into the insurance claim. You have enough to worry about in the aftermath of a collision. Let us deal with the insurance company. We know how to talk with the insurance company so that you can have your Kia returned to pre-accident condition. We can match the original color of your car after a collision. We use BASF technologies for our in-house paint and refinishing services. BASF is the industry standard and we offer lifetime warranties for our painting services.